John Guilbert Avildsen (December 21, 1935 – June 16, 2017) was an American film director. He won the Academy Award for Best Director in 1977 for Rocky. Other films he directed include Joe (1970), Save the Tiger (1973), Fore Play (1975), The Formula (1980), Neighbors (1981), For Keeps (1988), Lean on Me (1989), Rocky V (1990), The Power of One (1992), 8 Seconds (1994), Inferno (1999) and the first three The Karate Kid films. Avildsen was born in Oak Park, Illinois, the son of Ivy (née Guilbert) and Clarence John Avildsen. He was educated at The Hotchkiss School and New York University. Avildsen's first wife was Marie Olga Maturevich (Melissa McCall). After they divorced, he married actress Tracy Brooks Swope in 1987; they separated in 2006. He had four children. His estranged son Ash (born November 5, 1981), founded Sumerian Records. Another son, Jonathan Avildsen, appeared in the films The Karate Kid Part III and Rocky V. His eldest son was named Anthony and he had a daughter, Bridget. After starting out as an assistant director on films by Arthur Penn and Otto Preminger, Avildsen received his first success with the low budget feature Joe (1970) which received good notices for star Peter Boyle and moderate box-office business. This was followed by Save the Tiger (1973), a film nominated for nominated for three Oscars, winning Best Actor for star Jack Lemmon. Both Joe and Save the Tiger were about losers, but as the 1970s continued, Avildsen shifted to people who went on to be victorious. Avildsen's greatest success was Rocky (1976), which he directed working in conjunction with writer and star Sylvester Stallone. The film was a major critical and commercial success, becoming the highest-grossing film of 1976 and garnering ten Academy Award nominations and winning three, including Best Picture and Best Director. He later returned to direct what was then expected to be the series' final installment, Rocky V (1990). (Later installments were released in 2006, 2015, and 2018). He directed the mystery-drama The Formula (1980), starring Marlon Brando and George C. Scott. His other films include Cry Uncle! (1971), Neighbors (1981), The Karate Kid (1984), The Karate Kid Part II (1986), The Karate Kid Part III (1989) and 8 Seconds (1994). He also directed the drama Lean On Me, starring Morgan Freeman. 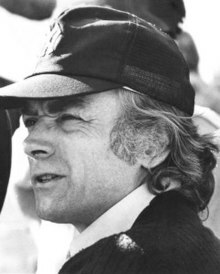 Avildsen was the original director for both Serpico (1973) and Saturday Night Fever (1977), but was fired over disputes with producers Martin Bregman and Robert Stigwood, respectively. His last-ever film Inferno (1999), starring Jean-Claude Van Damme. A documentary on the life, career and films of Avildsen was released in August 2017. John G. Avildsen: King of the Underdogs (2017) is directed and produced by Derek Wayne Johnson and features interviews with Sylvester Stallone, Ralph Macchio, Martin Scorsese, Jerry Weintraub, Burt Reynolds amongst others. The documentary is a companion to the book The Films of John G. Avildsen: Rocky, The Karate Kid, and other Underdogs, written by Larry Powell and Tom Garrett. Avildsen died at Cedars-Sinai Medical Center in Los Angeles on June 16, 2017. He was 81. The cause of his death was pancreatic cancer, according to his son, Anthony Avildsen. ^ "John G. Avildsen Biography (1935-)". Filmreference.com. 1935-12-21. Retrieved 2012-10-18. ^ a b Lentz, Harris III (August 2017). "John G. Avildsen, 81". Classic Images (506): 49. ^ Gitter, Mike (September 25, 2012). "Sumerian Records Founder Ash Avildsen on Success, 'Sumeriancore' and His Famous Father (Exclusive)". noisecreep.com. Retrieved June 17, 2017. ^ Fleishman, Jeffrey (June 16, 2017). "'Rocky' director John G. Avildsen dies at 81". Los Angeles Times. Retrieved June 19, 2017. ^ Fleishman, Jeffrey (June 16, 2017). "'Rocky' director John G. Avildsen dies at 81". Los Angeles Times. Retrieved June 16, 2017. ^ "John Avildsen, Director of 'Rocky' and 'The Karate Kid,' Dies at 81". The New York Times. 16 June 2017.